Search engine optimization performs best when it’s integrated into website design and maintenance programs. That’s because so many of the decisions that impact SEO occur outside of the bounds of old-school optimization. For example, perhaps keyword research indicates that “blue widgets” would be a great keyword to optimize for, and green and red widgets are pretty highly searched as well. If the team that built the site originally decided not to include color as a subcategory or filter, you won’t have an individual page to optimize for “blue widgets.” This happens far too often, and fixing the issue becomes an expensive platform change. A lot of time and expense, as well as potential damage to SEO performance, can be saved by integrating SEO into every step of the design and development process for anything on your site. Integrate SEO into each of these stages of site creation. Keyword research is a direct window into the hopes and desires of searchers. If they’re searching for something on Google, it’s because that topic interests them. As such, keyword research should be one of the pieces of data used in the strategic planning process for developing a site. An SEO professional’s role goes beyond representing the voice of the searcher, however, to also represent the needs of the search engines. The engines’ crawlers consume websites very differently than human customers do. Some of the things that are most engaging to customers are actually the least accessible to search engines. SEO professionals need to engage the strategic thinkers and the developers at this point to collaborate on ways that these super engaging elements can actually be made accessible as well. Traditionally this has been a “You can’t do that…” kind of a conversation from an SEO standpoint, but it should be a “How can we do this so we can also drive organic search visits…” kind of a conversation. In the strategy phase, the SEO professional will also typically audit the site, set organic search key performance indicators, and contribute to business or technical requirements documents. It’s important to get your SEO person involved early because creative and technical tasks tend to split into two parallel tracks after this stage, and SEO needs to be a part of both. From an SEO perspective, architecture is huge. Other disciplines may combine architecture into the strategy or the design stages, but it’s so important to SEO that I’ve called it out as its own stage in the site development process. In the architecture stage, the SEO professional needs to work with the user experience strategist or information architect to ensure navigation elements will optimally expose critical keyword themes. The sitemap creation that determines which pages will exist on the site and how they will interconnect essentially dictates the pages that will be available to optimize and how link authority will flow between pages. Wireframes determine how navigational elements will function and whether there will be any textual elements on the page to optimize. You can see how these two documents are absolutely crucial to the site’s future SEO performance. By combining the sitemap with the keyword research completed in the strategy phase, the SEO professional makes a keyword map. This map pairs every major page on the site with the keywords that that page will target. This, in turn impacts the page names and navigational anchor text used in the sitemap and wire frames. It’s a very iterative and collaborative process, and when done right SEO drives more customers to the site and those customers have a better experience while they’re there. Teams usually think to call in their SEO person toward the end of this stage — after the pages have been mocked up and approved, and content has been written. It’s time for metadata, so goes the thinking, so call the SEO person. By this point, however, so many decisions have been made that impact SEO that it may be difficult to salvage the program from an SEO standpoint. Yes, the pages of content need metadata and title tags and alternative attributes for images. And the content that has been written for brand voice and customer engagement needs to be tweaked gently to include the necessary keywords. But SEO is so much more than this. Just as the SEO person needs to collaborate with the user experience person and the designers in the architecture stage, the same needs to happen as those pages and navigational elements are being brought to life. Whether a navigational element includes a rollover and to what level has a big impact on SEO, because it determines how deeply the majority of the site’s link authority will flow. Whether a carousel of featured content can be designed to be accessible to search engines can mean the difference between ranking or not. 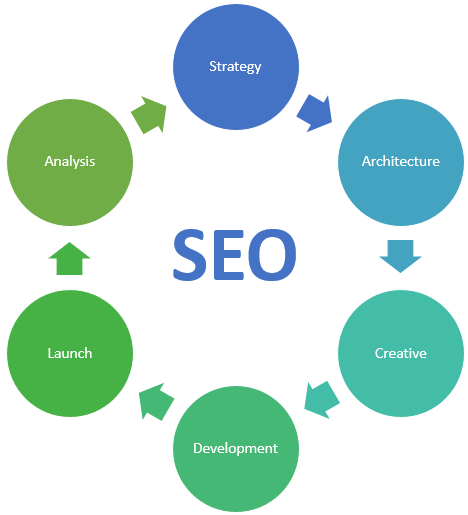 As mentioned before, SEO needs to integrate with development in the strategy stage. But when site development is in full swing, SEO needs to come along for the ride. The SEO professional needs to be involved to propose solutions to meet technical needs and platform limitations while protecting SEO performance. The SEO professional should be in the war room with the development team or on a conference call with them during the launch process. I can’t count the number of times I’ve worked with experienced teams who have accidentally disallowed search bots from their entire site at launch by pushing a single text file live that shouldn’t have been. When this happens, search engines will not crawl the site and organic search performance will drop rapidly. The SEO professional needs to be on call to test the 301 redirects that are so critical to site launches, as well as other SEO elements. The SEO job isn’t done after launch. Organic search traffic and rankings will probably be unstable for the first several weeks after launch. 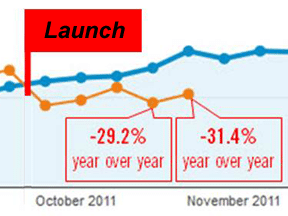 The SEO professional monitors and analyzes to determine when additional action is required during the post-launch SEO recovery period. At times, all that’s needed are assurances that the patterns in the data are normal and things will smooth out soon. At other times, deep analysis is needed to identify the root of the issue and resolve it so that organic search performance can recover. Naturally, the analysis process should feed back into the strategy phase, at the very least to begin to strategize on the next round of organic search optimizations.